Connor Beaton reviews the pamphlet Class Not Creed, 1968 by Richie Venton both as a historic account of events in Northern Ireland and as an indication of the current politics of the Scottish Socialist Party. Fifty years after the beginning of the civil rights movement in the north of Ireland, the whole island is coming alive with mass political activity. Campaigns against water charges, against sexual violence, for abortion law reform, for marriage equality, and for affordable housing have spilled onto the streets in virtually every major city in Ireland over the past five years. Protests in the south have consistently mobilised tens of thousands of people, particularly young people and women, and demonstrations have also taken place north of the border in a more limited way. Meanwhile, the Brexit vote in 2016 and the collapse of Stormont at the start of 2017 have precipitated a political crisis in the north, making partition a central political issue in perhaps the most serious way since the Good Friday Agreement was concluded in 1998. Against this political backdrop, a critical examination of the civil rights movement launched in 1968 could not be any more relevant. 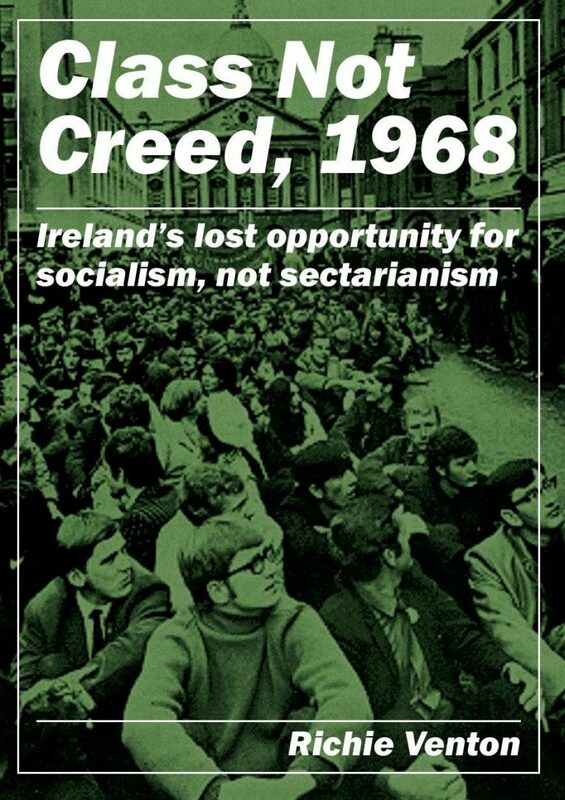 It is useful that Fermanagh-born Richie Venton, the Scottish Socialist Party’d national trade union organiser, has helped to open the space for this in Scotland with the publication of his latest pamphlet, Class Not Creed, 1968: Ireland’s lost opportunity for socialism, not sectarianism. It has already shifted hundreds of copies, according to Richie, and has been used as the basis for discussions at SSP branch meetings. The 18 page pamphlet is not a new work, but rather the republication of the opening to Socialism– Not Sectarianism: Labour & Northern Ireland Politics 20 Years On, which Richie co-wrote in 1989 with Peter Hadden, the late leading light of the Militant tendency in the north of Ireland. Richie, a teenager at the time of the civil rights movement, was by 1989 a key organiser for the Militant tendency in Liverpool. Therefore, the pamphlet repeatedly references the arguments advanced by the Militant newspaper while the civil rights movement was underway, even though it had only a “tiny” following in Ireland; this partly obscures the political reality in which the mass movement existed, and the political forces which drove it forward and influenced, to varying degrees, its collective decision-making. It presents events through one narrow, partisan lens. Of course, there is nothing inherently wrong with that – as long as readers know what to expect. It is particularly unfortunate that, by doing this, Richie erases one of the most immediate Scottish links to the Irish workers’ struggle: James Connolly, the Edinburgh-born trade unionist and leader of the Irish Citizen Army. It is a failing on the part of the Scottish Socialist Party that it fails to mention him once in its first pamphlet on Ireland in at least several years, published in Connolly’s 150th birthday year (just months after the Connolly150 conference, chaired in part by Róisin McLaren, who has since been elected the SSP’s joint national spokesperson). If we are generous and assume the exclusion was not a political slight, this instead highlights one of the shortcomings of republishing, without introduction or context, a text written for a different time and purpose than best serves the SSP in 2018. This understanding of events essentially relegates the role of the British ruling class, and by extension the British state, in Ireland to a purely passive one. Rather than working in tandem with northern unionists and deliberately provoking loyalist reaction to secure its interests in Ireland, the British state in the late 20th century was instead beholden to unionism and loyalism, thwarted in its new ambition of Irish reunification on capitalist terms. To back up this argument, Richie points to the landmark 1965 trade talks between liberal unionist Northern Ireland Prime Minister Terence O’Neill and his southern counterpart, Taoiseach Seán Lemass. But here, Richie overstates their significance and their intent; Cabinet documents released in 1998 reveal that even O’Neill’s predecessor, the hardline anti-Catholic bigot Basil Brooke, supported the talks, writing: “I do not think either the constitution or Protestantism is threatened in any way.”6 The talks were ‘symbolic’, as Richie says, only in the sense that even hardline Ulster unionists did not feel threatened by them. In order to believe that the British ruling class had by 1968 become a passive actor in Ireland, we have to accept, firstly, that the British ruling class had no continuing economic, political or military stake in maintaining partition and, secondly, that it therefore maintained partition for some other reason. Richie observes of the economy in the southern Irish state: “From 1958 the Southern capitalist government sought … closer integration with imperialism, throwing the doors open to foreign investment. By the ’70s, two-thirds of the 100 largest companies in the South were wholly or partly British owned. Over half the South’s imports and 70% of exports were with Britain.”7 The British ruling class, then, were very capable of extracting profit from the southern state without need for further constitutional upheaval. Richie also acknowledges that this turn to foreign investment was driven by the southern state’s inability to develop “a healthy, independent economy”, which he correctly identifies as a direct consequence of partition. Alongside this, the northern statelet provided the British state with a strategic military outpost on the island (particularly crucial in the context of both the Cold War and NATO’s latter-day expansionism, considering the southern state’s official military neutrality) and kept the boot of sectarianism on the neck of the Irish working class on both sides of the border. Richie accepts that the partitioning of Ireland “threw back the workers’ movement for decades”, but fails to explain why he felt partition did not continue to serve that purpose in the 1960s. Far from being an obstacle, the economic evidence cited by Richie suggests that partition was continuing to handsomely reward the British ruling class with the continued economic subjugation of the southern state, a strategic foothold in the north, and a marginalised and divided working class on both sides of the border. Besides these benefits of partition, the British ruling class have always been keenly aware of the consequences of withdrawing from Ireland. Richie touches on this briefly, but only “the prospect of sectarian civil war, with all the damage it could mean to industry and investment”. The stakes may well have been higher. Having lost a great deal of authority in the Suez Crisis in 1956, as well as all of its colonial possessions in Africa by 1968, the British Empire was in a long period of decline. However, Britain was far from acquiscent to the process; its costly military ventures in Malaya, Kenya and the Falklands are testament to that. As in 1916, when the Easter Rising shook the Empire to its core, the prospect of losing its foothold in its first colony threatened to deal a devastating blow to an increasingly defensive British imperialism. By the 1970s, with modern Scottish nationalism also gathering momentum, the total unravelling of the British state, ending Britain’s status as a world power, was not an unrealistic prospect. The extreme paranoia of part of the British ruling class towards the prospect of a united Ireland was articulated by Jim Prior, then Secretary of State for Northern Ireland, when he privately told Conservative MPs in 1983 that Ireland could become a “Cuba off Britain’s west coast”8 in terms of its threat to British interests. In terms of Ireland’s political trajectory, Richie acknowledges that British capitalists “were not entirely confident of the outcome if sectarian civil strife were to go unchecked, with the growth of socialist movements within the civil rights movement and an insurrection by the workers of the Bogside”.9 It is difficult to reconcile this assessment with the suggestion that the British ruling class were warming to Irish unity. On the civil rights movement itself, Richie’s principal criticism is that the Northern Ireland Civil Rights Association (NICRA) did not advance a socialist programme, and instead had “restricted their demands in effect to an equalisation of unemployment and slum housing, within a democratised, capitalist Northern Ireland”.11 He argues that the civil rights movement should have made an appeal to Protestant workers on the basis of class. This is undoubtedly correct, but Richie likely overstates the success of such a move. Writing in 1972, Eamonn McCann, the future People Before Profit MLA and previously a key organiser of the Derry Housing Action Committee (which Richie commends for campaigning “alongside Protestant tenants in the Fountain district as well as with Catholic tenants”12), shares Richie’s regret that not enough was done to build class solidarity between Protestant and Catholic workers. However, he suggests more realistically that the civil rights movement could have built “some tenuous links with militant Protestant workers”, rather than instigated a “mass deflection from the ‘loyalist’ camp”.13 Richie attempts to play down the extent to which Protestant workers were privileged over their Catholic counterparts by highlighting the poor conditions in Protestant working class communities like the Shankill. This ultimately minimises the degree to which the militancy of the Catholic population was drawn directly from material discrimination and the degree to which the base for loyalism was drawn from the relative privilege of the Protestant population, creating a gap which cross-community slogans alone would not be able to bridge. In terms of the content of a socialist programme, Richie proposes “a minimum wage, a massive building programme and a socialist planned economy that could ensure decent conditions for all with no discrimination”. He assigns little importance to the issue of partition, perhaps reflecting an impulse on certain sections of the left to focus narrowly on bread-and-butter issues at the expense of developing a wider institutional challenge to the state and the ruling class. This means that while Richie places himself in opposition to reformist currents within NICRA, he inadvertently leaves unchallenged the illusion peddled by those forces that the northern statelet can be reformed; centring a class analysis of partition in a socialist programme is equally necessary to challenge both reformism and left nationalism. Richie goes on to argue that the vehicles best placed to advance this socialist programme would have been the Labour Party in the south, the Northern Ireland Labour Party in the north, and the all-island trade union movement. In support of this, he points to the apparent leftward shift of the Labour Party in the south in the late 1960s, neglecting to mention that same party, under the same leadership, forming a coalition in 1973 with Fine Gael, who Richie himself describes as “the Tory party whose origins are in the fascist Blueshirt movement of the 1930s”.14 He notes the electoral success of the NILP and its positive role in the civil rights movement, but shies away from making a serious analysis of how it failed to make itself relevant in the years that followed, especially as partition became a more significant political issue; likewise, the nature of the Social Democratic and Labour Party (SDLP) and the reason why it became the southern Labour Party’s sister organisation in the north is not subjected to serious scrutiny. It is particularly interesting to note that Richie was writing his defence of the Labour Parties, north and south, just as the Militant tendency was questioning its long-standing commitment to entryism. By the end of 1989, the Irish section of the Militant tendency had abandoned the Labour Party in the south in favour of setting up what is now known as the Socialist Party, effectively disowning the very tactic which Richie continues to defend in a pamphlet re-published three decades later. Besides the content of Richie’s pamphlet, it is concerning that it came to be published in the name of the Scottish Socialist Party without reference to the party’s official position on Ireland. This was similarly the case with Richie’s previous pamphlet on the Russian Revolution, 1917: Walls Come Tumbling Down (also a republication of an earlier text, this time one from 2001 or thereabouts). The 1917 pamphlet was published without being presented to the SSP’s executive committee for approval, never mind the SSP membership. It is possible (though tenuous) to argue that the decision to publish 1917 was at least in line with the motion passed at the SSP’s 2016 conference instructing the party to “explain the truth about the Bolsheviks to the wider public” while making clear “the Stalinist degradation”, but the SSP conference has not discussed Ireland for more than a fleeting moment in years. The publication of 1917 was followed by a gently critical review in the Scottish Socialist Voice by the paper’s editor, Ken Ferguson (who has a different approach to the Russian Revolution, drawn from his background in the Communist Party of Great Britain), but no similar critique of Class Not Creed, 1968 has appeared. For all intents and purposes, the content of the pamphlet appears to outsiders to represent the official position of the SSP. This does a disservice to SSP members who could reasonably expect the opportunity to pick apart a subject of considerable complexity and importance (not least to the Irish community in Scotland), rather to have one point of view imposed on them, particularly in a pamphlet which peppers its arguments with hostility towards other left traditions on Ireland; Richie variously accuses left republicans of “ignorant assertions” and uses Tony Benn’s diaries to lay at least partial blame at Bernadette Devlin’s feet for the Labour government’s deployment of troops to the north of Ireland. With the British ruling class now in a period of sustained crisis as the UK’s exit from the European Union looms, there is an urgent need for the Scottish left to grapple seriously with major strategic questions, some of which also challenged the civil rights movement in 1968, and to identify the pressure points that can deliver advance for the working class. Building links with appropriate forces in the north of Ireland, based on a socialist analysis of the situation there, could be particularly useful. In other words, our understanding of the British state and its interests could prove crucial to intervening effectively in the months to come. Though it is smaller and less influential now than perhaps at any other point in its history, the SSP remains the most significant organised pro-independence grouping to the left of the Greens. With all due respect to the author, the SSP can and must make better contributions than this. Connor Beaton is a former member (2012-18) and national secretary (2017-18) of the Scottish Socialist Party. He works as a journalist focussing on Irish legal affairs.